Before the car, there was the bicycle. As a mode of transportation, the bicycle is one of the most widely used vehicles in the world. According to industry analysts, bicycles outnumber cars by a two to one margin. So it stands to reason that as the City of Lebanon advances the idea of the Mascoma River Greenway, a bicycle and pedestrian trail connection between Lebanon and West Lebanon, people are excited. So excited, in fact, that of the $2.2 million needed to deck four bridges, install signage, and pave the four-mile pathway, an amazing $1.6 million has been raised in just two years from private donations, City investments, grants, and sponsorships. The City entered the picture in 2003 with a cooperative agreement with the New Hampshire Department of Transportation to maintain a short section of the trail for recreational use. Five years later, the City established the Mascoma River Greenway Coalition and committed $50,000 to develop a Mascoma River Greenway Action Plan. Armed with cost estimates and a vision for the health, economic, conservation, and transportation benefits of the proposed Greenway, the Coalition got to work. And the rest, as they say, is history. Under the leadership of Frank Gould, a retired educator and former Chair of the Lebanon Recreation Commission, and Lebanon Director of Recreation & Parks Paul Coats, the project continues to gain momentum and is on track for completion in 2016. “It is tremendous to be able to utilize the rail corridor again to provide Lebanon with a connection between east and west, and to create markers highlighting the Northern Railroad’s significance to Lebanon’s history, connecting the past with the present,” said Gould. The Upper Valley Trails Alliance and Upper Valley Healthy Eating Active Living Partnership have provided technical assistance and small grants to the effort. 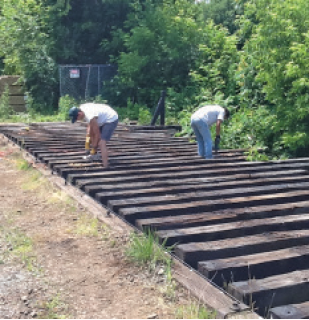 The Mascoma River Greenway, or MRG as it’s known locally, is one of more than 1,850 converted rail trails in the country, according to the Rails to Trails Conservancy, a nonprofit advocacy group. Rail trails are used for commuting, recreation, tourism, economic development, and of course, to improve your health. Economists have analyzed these things and report revenues from overnight stays, entertainment, food, and bike rentals in the hundreds of millions of dollars for destination trails like the C & O Canal Trail in Maryland, the Burlington Bike Path in Vermont, and the Confederation Trail in Canada. Having ridden all of these trails, I can vouch for the appeal of ice cream stands, a decent dinner, a reputable bike shop, and a comfortable bed on a long distance recreational ride. It’s a pleasure and a privilege to support the local economy. There’s a lot to be said for moving under your own steam, even if only for 10 minutes a day, according to researchers at the Pennington Biomedical Research Center in Louisiana. That’s about how long it takes to get up from your desk in downtown Lebanon and walk to one of the many access points along the Northern Rail Trail or the current Greenway segment extending from High Street to the Slayton Hill Bridge. At the very least, one can enjoy the benefit of unplugging from computers and cell phones to check out the natural beauty, cultural history, and soothing sounds of the Mascoma River. 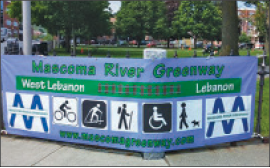 But one of the greatest outcomes of the work of the Mascoma River Greenway Coalition will most certainly be offering up a walkable and bikeable connection between the communities of Lebanon and West Lebanon, and the more than 50 school, work, and play destinations accessible along the corridor. As Victor Hugo said, “There is one thing stronger than all the armies in the world, and that is an idea whose time has come.” Three cheers for the Mascoma River Greenway Coalition and the City of Lebanon for paving the way to help more people live an active lifestyle. 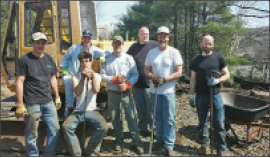 Learn more, donate, or volunteer for the Mascoma River Greenway project at mascomagreenway.com.